We are not talking about Christmas lights or Christmas trees here, no we are talking about a special kind of market taking place on the 23rd and 24th of December on the main square in Cusco. This special Christmas market is called Santurantikuy, its name is actually a mixture of Quechua and Spanish words. Santu comes from the Spanish word Santo, which means Saint. Rantikuy is a Quechua word meaning buying something for oneself. So those two words together basically mean to buy oneself a saint. Why buy oneself a saint? To this market come artists, craftsman and creative people selling all kind of Christmas decorations, objects to use for the Christmas crib. Those objects include moss and other natural plant that people use to decorate their cribs. It goes from the actual stable made from wood, to beautiful figures that possibly could be part of the crib including all kinds of animals. 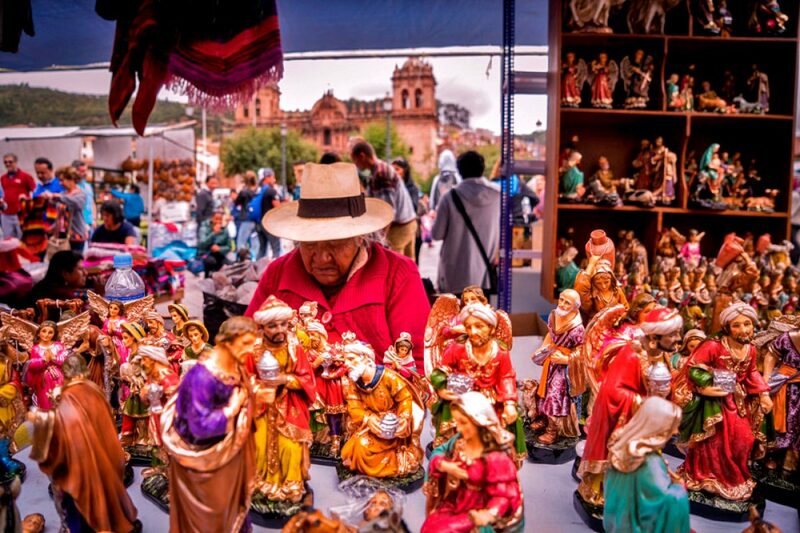 Said market dates back to the XVI century, during the colonial period it was part of the objective to evangelize the indigenous Peruvians by selling images of catholic saints on the steps of the Cathedral of Cusco. The market gets bigger with every year and more things are getting sold as well, now even clothes and paintings. Many sellers come in from the countryside and have to camp at the main square because it would be too far to travel back and forth. Santurantikuy is more than just a place where you can buy Christmas objects or presents, it is a social event! You can get something to drink there as well – just walk around and you´ll meet half the town doing the same. And for the sake of Christmas spirit why don´t you join other people serve hot chocolate and providing Christmas presents for the children of the sellers. They don´t have the nicest nights sleeping outside during those cold Cusco nights and are too poor to afford another place to sleep – so why not give back a little? !